OMEGALUX™ CS series cartridge heaters provide high wattage in limited spaces. They are manufactured with 300 series stainless steel sheaths to precise dimensions and tolerances to ensure maximum heat transfer for minimum core temperature and faster heating. 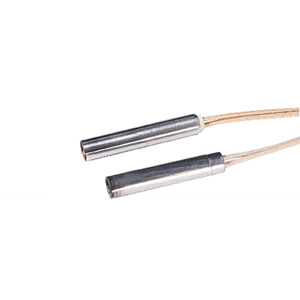 The CSS series cartridge heaters utilize an economical design of coiled resistance elements and ceramic cores, and can be used whenever a high Watt density is not required. The CSH series are high Watt density cartridge heaters which feature a swaged construction which allows for longer life at higher temperatures. See graph (below) for the maximum recommended Watt density when selecting the high Watt density, CSH series, cartridge heaters. CSS and CSH series cartridge heaters are designed to fit into holes drilled and reamed to the nominal diameter of the heater. The hole should be reamed to the fractional size with a +.001" tolerance. Insert “120V” or “240V” to indicate desired operating voltage.